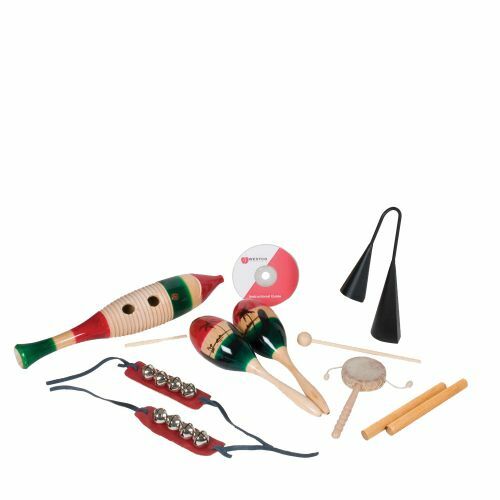 The 7-Piece Multicultural Rhythm Set includes: (1) 20" Chilean Rainstick, (1) Agogo Bell, (1) Monkey Drum (Djen-Djen), (1 pair) Latin American Maracas, (1) Latin American Wooden Fish Guiro with Striker, (1 pair) Ankle Bells, (1 pair) Hardwood Claves, (1) Instructional DVD, (1) Reusable Container with Lid, (1) Reusable Container with Lid, (1) Instructional DVD. (Kit content may vary from those pictured). Ages 3 years and older.